Eph. 4:11-13 (ESV) And he gave the apostles, the prophets, the evangelists, the shepherds and teachers, to equip the saints for the work of ministry, for building up the body of Christ, until we all attain to the unity of the faith and of the knowledge of the Son of God, to mature manhood, to the measure of the stature of the fullness of Christ. Joe Peter was born and raised in rural northern Iowa. He attended Central College in Pella where he met his future wife Sabrina. He became a Christian after his freshman year and turned his focus towards religion and philosophy studies. Though his studies he became increasingly convicted of a call to teach and preach God’s Word. After graduating in 2007, he moved to Chicago and attended Trinity Evangelical Divinity School in Deerfield while working in youth ministry and as a private tutor. Sabrina and Joe were married in August of 2008 and she moved to Chicago and became a pre-school teacher. In 2011, the Peter’s returned home to Northern Iowa. Joe began work as a carpenter while he served with the local church as pastoral intern and with youth ministries as well as Youth for Christ. 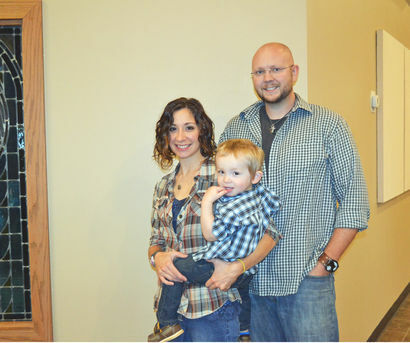 In April of 2014, Joe accepted the call of senior pastor at Center Street Baptist. Overseers are responsible for teaching and governing the congregation. As leaders they give guidance and direction to the church. As teachers they oversee the life of the church to preserve its biblical faithfulness. They are wardens of the Word of God. The basic meaning of the word 'deacon' is practical, active helping with respect to the basic necessities of life. The office of deacon exists to assist the leadership of the church by relieving the overseers of distractions and pressures that would divert them from the ministry of the Word and prayer and the general, visionary oversight of the church. Deaconesses are the backbone of nearly every ministry at Center Street Baptist. These servant leaders are involved with nearly every one of our events, communion Sundays, weddings, funerals, receptions, home care ministries and yes, even the famed Baptist potlucks. They organize, plan, create, clean, and generally make everything happening around the church run a little smoother. They are an indispensable part of what makes Center Street tick. Our deaconesses are: Hiede Wall, Marie Butenhoff, Becky Wehrman, and Lu Ann Lawrence.